The video, posted on Facebook, captured a short and tense verbal exchange last week between a young black Roxbury man and a young white Boston police officer. In the recording, the officer asked the man’s name, grilled him about where he lived, and quizzed him about why he wasn’t at work on a weekday afternoon. The man was not accused of committing a crime. The man, recording the incident on his smartphone, asked why the officer wanted such details. At one point, he calls the officer a pig, and in another moment he got close to the officer’s face. “Why are you bothering me?’’ the man asked the officer. The video of the confrontation, lasting a little more than two minutes, ended peacefully, but it exploded on social media during the weekend with people hurling accusations at both the police and the man who filmed the encounter. It also drew Boston police into another race-related controversy. 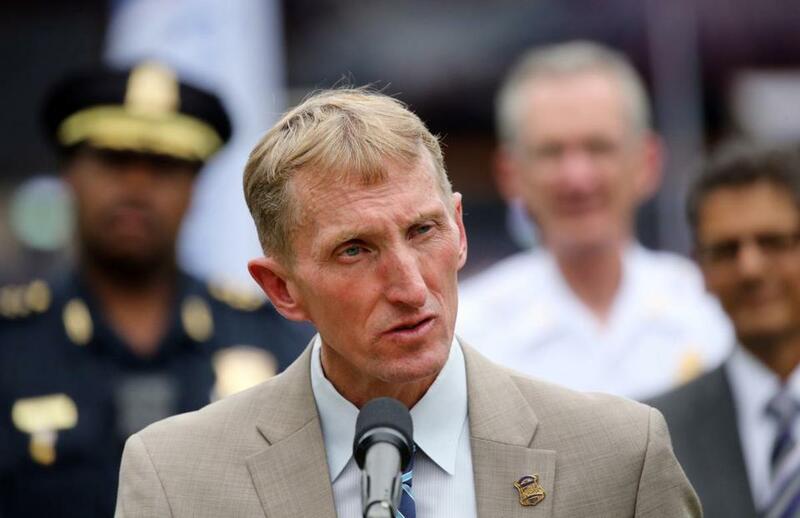 Boston Police Department Commissioner William B. Evans met with leaders in the city’s black community Monday to discuss the video and assured them “the matter is being discussed and the officer is being counseled,” authorities said. Civil rights advocates and local activists said the incident reflects what they have long complained about — that young black men are routinely stopped and interrogated, contributing to a fractured relationship between police and the black community. But the Police Department said the officers in the video were simply doing their job. Top officials at City Hall and in Boston Police Department, have “always disputed, dismissed, diminished our community’s evidence, experience, testimonies that say that this type of interaction exist,” said Jamarhl Crawford, a Roxbury activist who organized a press conference Monday to address what he said was, at best, an improper police stop. The advocates stood outside police headquarters and demanded that the department strengthen its civilian review board, provide a “tangible commitment to transparency and accountability in the department,’’ and fully implement a body camera program. “We need more data, we need more transparency, we need more accountability, and we need to confront this narrative that the Boston Police Department does it right when there are so many examples of them not” doing the right thing, said Rahsaan D. Hall, director of the Racial Justice Program at the American Civil Liberties Union of Massachusetts. The Police Department is looking into the incident, said spokesman Lieutenant Detective Michael McCarthy. “We are aware of the video and it is being reviewed to determine if any department rules were violated,’’ McCarthy said. The verbal exchange occurred around noon Thursday on Charles Street in Dorchester’s Fields Corner between Officer Zachary Crossen, a member of the department’s Youth Violence Strike Force, and Keith Antonio, a 25-year-old cook, according to activists, Antonio, and police. McCarthy said police know the man as Keith Howard. McCarthy said the officers were in the area keeping watch on a house “known for gun activity.” Antonio was “known to police” in Boston, Brockton, Brookline, and Dedham, according to McCarthy. Antonio had previous minor charges in Norfolk and Suffolk counties, law enforcement officials said. Antonio gave Crossen the middle finger during the entire encounter, McCarthy said. Antonio told reporters at Monday’s press conference that he had exited an Uber and was on his way to a barbershop when he saw two officers in their car staring at him. Because of previous encounters, he said he made a mental note to record the officers if they confronted him. The officers drove off and returned, pulling up beside Antonio. And when they did, he started recording. The video, which has since been removed from Facebook, only shows Crossen’s exchange with Antonio, although it briefly shows the other officer. It does not show Antonio’s expressions or gestures. However, at one point Antonio turned the camera to show his face with Crossen’s in the same frame. The video shows Crossen, wearing a Boston Bruins winter hat, yelling out at Antonio as he was walking. “You aren’t Kevin by any chance, are you? Crossen asked. Crossen asked Antonio what he was doing on the street, if he was “killing time,” and what he was doing on the street around noon. Antonio said he was going to the barbershop and that he saw no reason to tell the officer where he lived or to give his name. Neither man seemed to want to back down. The video shows Crossen pulling out his own phone and directing it at Antonio. In the background, Antonio can be heard calling the officer “stupid” and a “pig” and saying the officer was wasting time stopping the wrong person. Crawford, the activist, said whether Antonio was rude or not is beside the point and does not justify an improper stop. Speaking to reporters, Antonio acknowledged that he flipped off Crossen, but said he did so only after the officer pulled out his own camera. And he said he used strong words at the officer out of frustration. “I just want to get justice and see if anything can change, because a young black man shouldn’t be threatened by [police] just walking down the street and going about his day,” he said.